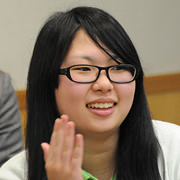 Minori Endo lives in Ishinomaki City in Miyagi Prefecture and is a first-year student at Ishinomaki Senshu University. She participated in the TOMODACHI Summer 2012 BEYOND Tomorrow U.S. Program where she learned about the U.S. experience with post-disaster reconstruction, and shared her own experiences with Americans. I am Minori Endo from Ishinomaki City. March 11th. I lost everything, as the cold continued. The city which I had lived in. The house I grew up. And my Father that I loved dearly. The tsunami took everything away from me in one moment. Right after the earthquake I called my father, and miraculously, he picked up the phone. My father said he was coming home now, and through the phone, I heard him turn on the engine of his car. That was my last conversation with my father. I watched my house being carried away by the water as I stood on higher ground. Black water swirled around the city and I heard someone cry for help. At that time, I was unable to do anything. I felt completely powerless. I am an only child and was a Daddy’s girl. I could not accept my father’s death, and until my father’s body was found, I called his cell phone every day. I was filled with dread every time I called, knowing that no one would answer. Once I confirmed that no one would answer, I would hang up the phone and cry. People kept speaking about “recovery” but my heart had stopped in that moment. I wanted to be stronger but I did not know where the strength was within me. I wanted to be stronger but I did not know what to do. Those days kept passing by. That is when I found BEYOND Tomorrow. I did not know what I could do, and I found a place where I can discover what to do. Until then I felt alone, but through BEYOND Tomorrow I found friends that I bonded with, with whom I was able to share the best of times, and developed lifelong friendships. In order to make this a reality, I applied to the BEYOND Tomorrow U.S. Summer Program. So that I can discover relationships abroad and can share my feelings, as the TOMODACHI Generation. Every place I visited in America, I delivered a presentation about Tohoku in English. The Americans would listen and accept each and every word that I uttered. Many people said “thank you” – thank you for coming and thank you for telling us your story. These words made me realize the significance of communication. There are times when I think back to the disaster and it saddens me. However, we have a responsibility to tell the next generation what happened when the disaster occurred through communication and sharing this story. Visiting America this summer made me realize that I would like to be a journalist and connect people through the power of words. By making this dream come true, I want to be living proof of my father’s life. The past cannot be changed, but it is possible that there are opportunities for a bright future. As the TOMODACHI Generation, we need to support, encourage, and stimulate each other. Together, I believe that we can strengthen the future of Tohoku, Japan, and the world.